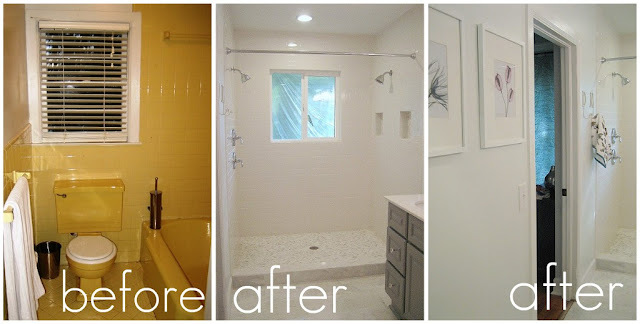 Ten June: The Big Reveal: Our Bathroom Renovation Is Done! Folks, this moment in time has been about a year in the making. I think I've said just about enough! Feel free to post any questions you might have in the comments- "how to" questions, source questions for items you see, etc- and I'll leave answers and links down in the comment section. For a full source list, check out this post. Without further ado... here is a full tour of our (mostly) do-it-yourself renovated master bathroom! *one quick note: this awesome art is from Modern Bird Studios! I guess I could have warned you... there are a looot of pictures : ) Bet you feel like you know every ounce of that tiny little rectangular space now, don't you?! I'm just so proud of it, I had to share every corner. And thanks to all of you for your sweet comments, encouragement and support! Annnnnd I'm starting to sound like I'm accepting an Emmy right now. I'm such a dork. But seriously, this bathroom rocks. COVER DAVID'S EARS Now it's time to move on to our next project! PS. You can also find me over at Centsational Girl today. I'm a contributive writer for CG and today, I shared one of my favorite new design trends- all things rustic! I've even got a few DIY rustic projects described in the article, so be sure to check it out! I am seriously so obsessed with your bathroom!!! I've been loving all white kitchens and bathrooms for a while now but your small additions of gray are even better! Okay, tell me 'bout the tile. Floor tile, subway tile, and shower tiles...I need details! seriously IN LOVE with that honeycomb tile and your vanity. gorgeous bathroom! congrats it looks great! xoxo jillian:: don't miss my fishs eddy dish giveaway! LOVE LOVE LOVE! You guys did a great job! I especially love the tile and the mirrors! LOVE LOVE~! michelle, you guys did an awesome job! love the mirrors you chose and the tiles! amazing! It's beautiful! Love that you put in the water closet... I wish our bathroom was large enough to add one haha. WOW, michelle! worth the wait... so worth the wait! it is amazing! ad you know one of my favorite parts is that vanity which was such a hard thing to finally achieve! :) i also loooove your choice in materials- the floor tile is awesome... all of it! So beautiful!! Where did ya'll get the D & M towel hangers?? I love them!! It looks amazing!!! All your hard work definitely paid off. It is just perfect. OMG!!!!!! I love it! What an awesome job! Great job on the tile. It's gorgeous! I also really love the paint choice on the cabs. What a FANTASTIC bathroom!! Seriously, all your had work paid off. Its fresh, bright, and beautiful. You guys did an awesome job. eeek! i die. its too fabulous!!! love the tile!!!!!! Michelle it's PERFECT! I really love it! Everything about it is just beautiful. The mirrors are fabulous! Excellent job! GORGEOUS! You did such a wonderful job! It looks fabulous! WOW! This is so amazing. You guys did such a great job! I love the shower cutouts! And the letter hooks. And the....ok the WHOLE thing! Yep, your bathroom is amazing! You did such a great job selecting all the materials, it is beautiful! Nice job!! I love seeing the finished room after seeing where it has come from. I featured your blog today at stylesson.com. Again, so so pretty! I love all the finishing details... the mirrors look great, the letter hooks... great work! What a transformation - it's gorgeous now!!! I like the new layout a lot, so much better. And the vanity is beautiful, but I'm also loving your tile choices - the honeycomb and subway tile in the shower is fabulous! You did amazing!! Where did you get the toilet paper magazine combo holder? Love the bathroom vanity! What is the paint color? How was it done? Looks AMAZING!! Love the tiles and the gray vanity! I bet you are so happy that project is done! Absolutely gorgeous! I'm obsessed with the marbled tiles and the color of the vanity. It's stunning! Wow! It looks so beautiful! I love how clean, fresh and modern it looks. The colors and finishes are gorgeous together. It's gorgeous! And, so serene. Love that pocket door! Oh, Michelle! It's amazing. So gorgeous. I love how clean and fresh it is. You must love getting ready in there. WELL DONE! this is sooo encouraging...i sometimes feel like we keep beginning projects, but never finish one!!! I lOVE how you rearranged everything..and two shower heads? oh yes, my hubby will be getting word of this! :) thanks for sharing- it looks tranquil, almost spa like :) enjoy your new bathroom! Congrats Babycakes! The bathroom looks like you -- fresh and modern! Wow! It's so inviting and peaceful. I love the door change and all the tile work. It's really beautiful! It's really beautiful and so serene. I was obsessing over that great towel and I saw it yesterday in Boscov's - perhaps Lenox? It's really pretty. And I love your shower! Love it! what a gorgeous bathroom!! one question though because we are in the process as well... how are you liking the glass window pain door that lets you see right in? I really like everything! It looks great! I have my eye on that small tile you used at the bottom of the shower! AWESOME! This looks great Michelle! What a transformation from the yellow. Really love the mirrors and how they are angled on the wall! love the bathroom. i am doing a similar looking re-do currently. what color paint did you use on the walls? is it a light gray? thanks! Ooooo la la!! This is sooo gorgeous, Michelle. Love all the cool crisp tones ~ super fresh. :) Kudos! What an amazing transformation!! Everything you have done to your home is beautiful!! Love is an understatement!! It's spectacular (: All the finishes, accessories etc...they are all stunning. Such a great eye, girlfriend! Lovely and beautiful---I hope you submit the photos to a magazine - they are worthy of publication! Enjoy your hard work and gorgeous designs! It is perfect! Agree with Linda... definitely magazine-worthy! I adore the hexagon tiles. Wow, it's AMAZING! It's a total 180 from the banana yellow fiasco. Gorgeous work. Congrats! It turned out great! So worth the year of reno, I'm sure. We are re-doing a guest bathroom so I know how awful the process is. And since we are doing the work ourselves...it's taking a long time. I have to ask about your mirrors. I was thinking about using mirrors like yours so I would like to know how they are working for you. Since they seem to tilt forward, is that an issue? So serene and lovely!!! Such an amazing job! oh my goodness michelle it looks INCREDIBLE!!!! i absolutely love it!! It's beautiful Michelle!! You and your hubby did an awesome job. I want it!!! Wow, love the tile! I might just have to run to HD and pick me up some of the floor tile, so pretty! Love how this turned out! The double shower heads, tile, and pocket door are chic and practical! NIce job! Holly- the bird hand towel is actually just a cheapie little Target find! Cute, isn't it? Bee- we are loving the window paneled door. It lightens and brightens the space from our master bedroom, instead of shutting it off. It makes it more like an extension of the room, which we need since it's such a small bedroom! As for privacy, we have privacy with the pocket door for the toilet area. The shower area is not visible from the door, so there is some privacy there. Of course, when we have little ones someday or if we have guests over, we would simply shut the door to the bedroom for more privacy. We love it! Anonymous- The wall color is actually a verrrry light blue color! It's Gliddens Misty Moonstone. Could you tell me where you purchased the vanity? It is exactly what I have been looking for to add to my bathroom..Thanks! It looks huge ! the lighting, the tiles, the decoration. I love the gray vanity! Okay, I love it all! I am painting a few things in my bathroom and the vanity is one of them. Was going to paint it white, but after seeing these pics I think gray would be awesome! Can you tell me what color the vanity was painted? If you went over this in a different post, sorry, this is the only one I have read. Perfection! Love all of the little details. And double shower heads are a dream of mine! You guys did a wonderful job! Gorgeous! The transformation is incredible! You did such a great job. I love all of the tile! The flooring and white subway are elegant and classic. the bathroom came out amazing!! i love the color of the vanity! and the artwork is awesome too! you guys did a great job! BTW, did you mention what color you painted the vanity? It is gorgeous Michelle!! So calm and pretty, I would love to get ready for the day in that bathroom! 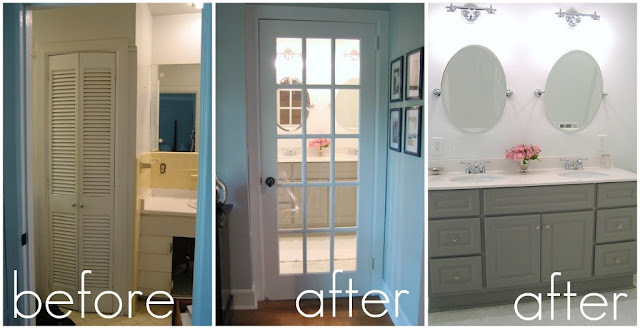 Michelle- I loved your bathroom redo so much that I decided to feature it on my little blog on Wednesday. Feel free to stop by and check it out! The bathroom is amazing! I'm absolutely loving that gray vanity! Beautiful! Loving the subway tile... so clean and fresh! Oh my, that is lovely! I had to wipe some drool off the keyboard to type this! Love the gray and the mirrors! I love the new color scheme! It looks like it will always look clean too:) I found you on homeaker on a dime. A DREAM! I love every.little.detail of it!! Did you do this yourselves? I am so impressed and am hoping to do a similar tiling job for ours. Beautiful job! Enjoy it! I can't believe I hadn't commented on this before! Your bathroom is totally gorgeous! You guys should be so proud of yourself- I just LOVE it!!!! Y'all did a wonderful job. It doesn't even look like the same room! Fabulous remodel! I'm stealing your tub-to-shower idea. Just what I've wanted for our bathroom!!! Simply gorgeous!! I am trying to decide what to do with our Master bath and this is some incredible inspiration!! Enjoy your new bathroom!! Holy crap! Pardon my language, but that is amazing! Loooooove the double shower!!!!! Just stopping over from Young House Love to say wow wow wow and WOW!!! My husband and I are not really DIY people, but I LOVE seeing the hard work of those who are. Great job guys! I love your shower! Wow! Amazing transformation! Stopping by from YHL. Totally amazing redesign! Where are those towels from??? I am obsessed! Amazing renovation! We have a similar master bath in our house. Would you mind sharing the dimensions of the entire bathroom? I apologize if you've already done so! GORGEOUS - and so inspiring as I'm planning our master redo :) Love the idea of the window door (our master bedroom is small also so adding the visual "extra" space of the bathroom is a great idea for us. Also -love love love that shower! The hex tiles are awesome! We were thinking white subway walls, but that just adds the extra pop! I'm already on the Home Depot site looking for them - Can you tell me if they are the Grecian White Marble Hex tiles, or which ones they are called on the website? Thanks and i hope you enjoy MANY years in this fabulous bathroom! BlondeJeni- the handtowel is actually from Target! Cute (and cheap!)... my favorite combo! Thanks again, folks! Let me know if you have any other questions! What a change! I'd be walking on air. That's like my dream shower, and oh, the pocket door. Almost makes me want to reno, but I don't know if I could stand the craziness! Did you have to replace the window since it's now in the shower? We're looking to move ours under a large window but have concerns about water damage. Also where did you get the vanity? Is it painted? Beautiful makeover. I love marble, white and grey. The perfect combination for a bathroom! Michelle, I can't believe I'm just now seeing this!! It's GORGEOUS! You guys did a fantastic job! I love your bathroom...especially the shower. I love your style too with the pop of pink flowers. What did you choose for a shower curtain? Was it a DIY curtain or did you buy one? You've done a fabulous job with your bathroom and I love the details (oh and those tiles - gorgeous!!!) I've got this linked to my bathrooms post as well today, for inspiration! Gr8 makeover ! Awesome job...we are going to try replicating this in our master. But, I had the same concern as "Leigh" above. How did you work with the window in the shower. We now have the tub there, but would like to flip it for a double shower. Thanks. This is absolutely spectacular! I am in love with your color combos! You guys did a fantastic job! What kind of finish did you use on your cabinets/vanity? I know you said Martha Stewart Cement Gray but was it a matte trim paint? I LOVE you bathroom renovation! We are just starting ours (and our bathroom looks VERY similar to what yours used to)! I actually had already picked our marble hex tile for our floors and subway tile for the walls when I saw this post! We're a teeny bit worried about the shower floor being slippery. What finish did you use (honed or polished)? and is it slippery? Your bathroom gives me hope!! Please please tell me where you found those amazing mirrors!!!!!!!!!!!! The tile in your shower is exactly what I have been searching for. I see in one response that you got it from Home Depot, but I have been unable to find anything like that on their website. Do you happen to know the exact name of the tile? Maybe I can call them or find it somewhere else? Thank you for your help. Your bathroom and home are lovely. Your bathroom renovation looks so beautiful! I'd love to pin it to the Home Depot tile pinboard if you wouldn't mind! Hi Michelle, I'm redoing a bathroom that currently has only a toilet and sink in it. I'm trying to figure out if I have room to add a shower with the dual shower heads like yours. Can you tell me the measurements of your shower. Hi Julie! I shared our basic dimensions here: http://www.tenjuneblog.com/2011/01/whats-plan-stan.html. Good luck! This is such a inspiring renovation. I liked it and these round shape mirrors are looking really awesome. Thank you for sharing. The renovations are beautiful. Hi! I love your bathroom! I'm debating over marble in our master bath right now. Is your bathroom floor polished or honed? How is it wearing? You share informative post I hope you will share another good post.